F. Scott Fitzgerald is my favorite author. His prose has a wonderful lyricism that shows a real knack for capturing the beauty in the simplest of moments. The way he composes a line can delight in its construction while breaking your heart with its vocabulary. His stories have an outer glitz that serves as a mask to the dark romanticism behind it. He always showed his readers the diamond first, and then the price it cost a man's soul second. I don't think I've ever seen a film adaptation of Fitzgerald's that has captured that ephemeral quality of his prose--that is, not until I had seen The Curious Case of Benjamin Button. Ironically, the film that pulled off this feat is the one that has the least to do with the actual source material. Outside of the title and the basic concept of a man born old and aging backwards, ending his life as a baby, the film of Benjamin Button takes virtually nothing from Fitzgerald's short story. It does, however, draw on the author's complete works in theme and tone, tackling notions of doomed romance, reinvention, and indulging in the full flavor of life. Hell, even the scenes of drunkenness feel like they could be pulled from any number of Fitzgerald's jazz age stories--or even from his biography. The Curious Case of Benjamin Button was adapted by writer Eric Roth (The Good Shepherd, Munich) and directed by David Fincher (Zodiac, Fight Club), one of our very best contemporary American directors. The filmmakers decide to set the "present" of the story within recent history. As Hurricane Katrina closes in on New Orleans, one of its oldest residents, a dying woman by the name of Daisy (Cate Blanchett), lays in her hospital bed, attended by her daughter (Julia Ormond), who reads to her mother from the diary of a long lost friend named Benjamin Button (Brad Pitt). Benjamin's story encompasses the whole of the 20th century. Born on the day World War I ended, we watch Benjamin travel through the Depression, WWII, and even Beatlemania and the 1980s. This is no Forrest Gump journey, however, Fincher doesn't place his character in obvious historical and pop cultural moments; Benjamin's life is one lived out of the public eye, as befits a man who is steadily growing younger by the year. Abandoned by his father, raised under the monument of a train station clock that runs backward (an excellent side story, and a Fitzgeraldian metaphor if ever there was one), Benjamin spends his early years under the care of Queenie (Taraji P. Henson), the caretaker at an old folks' home, before getting young enough to strike out on his own. Booking passage as a worker on a tugboat, Benjamin sets off to see the world, meeting interesting characters wherever he goes, and nursing the love he holds in his heart. Despite technically being the same age, when Benjamin and Daisy first meet, he is an old man and she is a little girl. Through the years, as their respective ages travel toward a common middle, the pair goes through many reunions, false starts, and misunderstandings before Benjamin finally becomes the man he wants to be and the lovers join at last. Anyone who has read The Great Gatsby will recognize the similarity between this trek and that of the tragic title character from the novel. In fact, the name Daisy--which was not the name of the entirely different romantic interest in the "Benjamin Button" short story--is a nod to Daisy Buchanan, the unattainable object that Jay Gatsby seeks to acquire. Apparently The Curious Case of Benjamin Button has been in development for nearly fifteen years. (Turns out we were spared a Ron Howard version starring John Travolta; thank God!) I imagine one of the biggest challenges was how to deal with the aging factor. Not only do we need to see old man Benjamin with a wrinkled body proportional in size to a newborn and a young child, but we also have to see him at the various ages of a full-grown man. Likewise, we have to see Daisy getting older while he gets younger. Brad Pitt and Cate Blanchett are required to play both above and below their respective ages, and with the help of make-up and what I assume are some imperceptible digital effects, David Fincher has pulled it off remarkably. Though it's hard to pin them down in the ill-defined years of their 30s and 40s, when the two actors should look most like themselves, the transformation is still rather seamless. Credit is also due to both of the actors, who don't let the make-up do all the work, but who expertly walk in the shoes of different eras while maintaining the core of who they are. It's not the only visual feat that Fincher pulls off, either. From recreating Depression-era New Orleans to the oceanic battles of World War II and 1950s Paris, the director paints across the screen like a vast canvas. A sunset witnessed by Benjamin and his ailing father (Jason Flemyng) is a gorgeous portrait of light and shadow, of water vs. sky. Equally stunning are images of burning battleships or a dancing Daisy silhouetted in night and fog. It's in these moments that Fincher captures the feeling of Fitzgerald's prose, his pictures evoking the words the way Fitzgerald's words so vividly created pictures. Similarly, the way the director uses classic film styles to reference the memories of characters in the story, including a running gag involving a man being struck by lightning, effectively simulates how Fitzgerald characters might remember times gone by through songs they loved or books they read. At nearly three hours, The Curious Case of Benjamin Button is as rich as any thick novel covering the full scope of a man's life. (By comparison, Fitzgerald did the same in a much shorter space. The short story "The Curious Case of Benjamin Button" runs twenty-two pages in my The Short Stories of F. Scott Fitzgerald. There's a reason we still regard him as the master of his chosen craft.) The movie is never dull, and it manages to maintain the air of a shared story without ever being overly sentimental, even in its most romantic or emotional moments. With life being lived in reverse, there are also many reversals along the way, with survival and death being constant factors. David Fincher and Eric Roth make some ingenious decisions for how to close out Benjamin's life, and the final montage of memory and the lovely metaphor of an entire century being washed away by the rain takes us to a poignant finish that exposes the whole wonderful narrative design that the filmmakers have been laying out for us. 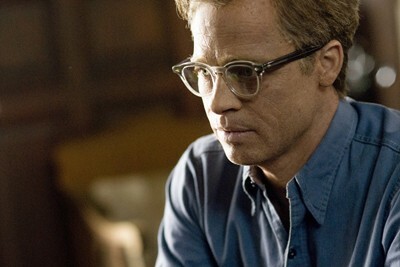 If The Curious Case of Benjamin Button isn't the best film of 2008, it's very near the top. When it comes time for my biography to be told, I can only hope that I would have spent my time as well as this fictional character, and I can only dare to dream that it might be executed with as much grace and depth as David Fincher has achieved here. An existence well lived, a story well told--surely there is nothing greater than that. Buy tickets to "The Curious Case of Benjamin Button" now!